To make it easy to access the new FEMA flood maps, I’ve compiled different links and downloads just for the Hoboken area. I’ve added explanations of the different flood areas as these are hard to find on the FEMA arcgis site. Area of moderate flood hazard, usually the area between the limits of the 100-year and 500-year floods. Are also used to designate base floodplains of lesser hazards, such as areas protected by levees from 100-year flood, or shallow flooding areas with average depths of less than one foot or drainage areas less than 1 square mile. Coastal areas with a 1% or greater chance of flooding and an additional hazard associated with storm waves. These areas have a 26% chance of flooding over the life of a 30-year mortgage. Area of minimal flood hazard, usually depicted on FIRMs as above the 500-year flood level. NOTE: If you would like to submit information about your location in Hoboken or surrounding area during the hurricane, go to the new crowdsource map I’ve set up at www.hobokenflood.crowdmap.com. You can create a written report as well as upload photos documenting your experience. This information can be used for future maps and possible future emergency planning. I would like to eventually update these maps with more detailed information from these reports. 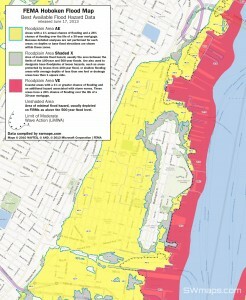 Here is a bookmarked link directly to the to the new FEMA map for Hoboken on their arcgis website. Here is a large screen shot of the map as a jpeg that you can save to your computer. Before Hurricane Sandy, FEMA had begun a coastal flood study to update Flood Insurance Rate Maps (FIRMs) for portions of New York and New Jersey using improved methods and data to better reflect coastal flood risk. After Sandy, FEMA released Advisory Base Flood Elevation (ABFE)information based on the partially completed flood study for certain communities which were designed to help in rebuilding and recovery efforts. FEMA is now in the process of releasing preliminary work map data including the full results of the coastal flood study. The preliminary work map data is based on the same underlying data as the ABFE information, but includes the results of a more refined analysis of shoreline conditions, including the effects of erosion and wave runup. The preliminary work map data is a “draft” product that FEMA is sharing in advance of the upcoming release of the preliminary FIRMs. The preliminary work map data will replace the ABFE information (where applicable) as the best available flood hazard data until the release of the preliminary FIRMs. Until preliminary work maps are released for a community, ABFE information (if available) will continue to represent the best available flood hazard data in those areas. In areas where no ABFE or preliminary work map information is available, the current effective FIRM should be used. Preliminary work map data will be added to this Best Available Flood Hazard Data Map as it becomes available. Where applicable, ABFE information for communities where preliminary work map data has not yet been released will continue to be made available through this map since it will continue to represent the best available flood hazard data until the work map data is released. On the map, the symbology for the preliminary work map data is different than the ABFE information in order to distinguish between the two data sets.